You can now connect to us on Facebook and Twitter. The Bongo is officially called a MazdaBongo Friendee or Ford Freda, and is a multi-purpose vehicle (MPV) and weekend camper which is gaining popularity due to its versatility – it is equally at home as a van, campervan or people carrier. 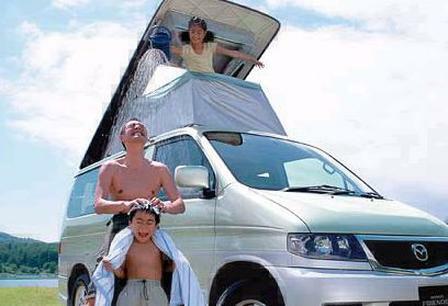 The Mazda Bongo Friendee was introduced in 1995 and was based on a people carrier. The Ford badged version began selling in the Japanese home market as the Ford Freda. There is also a Mazda Bongo Workshop Manual available for those who want to service or repair their own Bongo. into campervans. All of them have fold down seats downstairs to make a double bed, and on many models there is also an 'Auto Free Top' elevating roof which can sleep a further two people. Flat-top Bongo versions are also available affectionately known as Bongolows! Launched in 1995, they usually have automatic transmissions with a few manual transmission versions available, and come in 2WD (SGL3) and full time 4WD (SGL5) versions. The Bongo engines most commonly is a 2.5 turbo diesel engine with a few 2.5 V6 petrol versions and 2.0 petrol available. Later (post-1999) models have a revised bodystyle and have different engines, although the 2.5 turbodiesel continues unchanged. Air conditioning, cruise control, climate control and electronic blinds are fitted as standard.